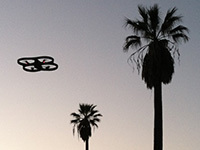 How comfortable should Americans be with the growing use of drones by all segments of society? DRONES IN MY BACKYARD is a funny and scary video mash-up about the coming of aerial drones to the United States. One day a drone appears in the filmmaker's backyard, hovering over his head. It's the catalyst for an extended meditation and free association on the presence of drones in war-making, the role of drones in surveillance, and the thrill of flying when you put on goggles to see what the drone sees. Whether it's the Predator, the Argus, or cute little Hummingbirds, drones of all shapes and sizes are flying to a rock and roll beat. We see them following us...and listen to the incessant buzzing of cameras overhead. Other films by Alan Snitow and Deborah Kaufman are Secrets of Silicon Valley, Thirst and Between Two Worlds. "Drones In My Backyard does a spectacular job of exploring the implications of drones entering our domestic air space by 2015. It asks all the right questions, presenting perspectives of those in Gaza and Pakistan who live with the buzz of drones daily, as do the directors who wonder about the loss of their individual privacy as drones hover in their backyard...The film conflates this footage with positive uses for drones - hobbyists playing, juggling drones, farmers monitoring crops, environmentalists watching for proper care of rivers and forests - and we are presented with a compelling aerial vision: A vision that suggests, while we may have a flyby view of the Statue of Liberty, we are also set to lose more liberty as drones enter our domestic airspace invading our every privacy." "Whether constructed for recreation, surveillance, law enforcement or for subject elimination, drones have become a topic evoking an even greater range of emotion and responses. This DVD describes in a masterful way the diversity of sizes, construction materials, designs and purposes for these machines...Whether the drones evoke fear, wonder, or hope, this DVD provides the viewer with not only information about them but poses questions that allows for further probing on one's own views about what glides, soars and or hovers above us. Drones in My Backyard is a concise but revealing overview of this continuing emerging form of technology." "A good...introduction to key issues concerning the advent of military and civil Unmanned Air Vehicles (UAVs), otherwise known by the public as drones. The adverse consequences of UAVs are emphasized over the benefits." "I could easily see the film presented in courses on science, technology, and society, with students themselves applying various theories to the 'case' of drones...Entertaining and fast-moving." "An unforgettable short film that beautifully captures an increasingly surreal aspect of the twenty-first century, Drones in My Backyard is highly recommended." "[The filmmaker] uses original interviews and footage, spliced together with clips from PBS, the Israeli Army, YouTube, and other sources to demonstrate the potential uses of drones...With a playing time of 13 minutes, robotics or government classes would have ample discussion time for practical or ethical issues, and budding engineers could consider positive and negative possibilities before assembling any unmanned aerial vehicles." "A solid, short overview of a hot topic...This is recommended." "Snitow's sighting of a neighbor's drone in his supposedly private backyard leads to a musing on drone technology's growing ubiquity. How comfortable should Americans be with current uses of unmanned aerial vehicles?"